Definition at line 26 of file TargetOptions.h. If given, the name of the target ABI to use. Definition at line 42 of file TargetOptions.h. 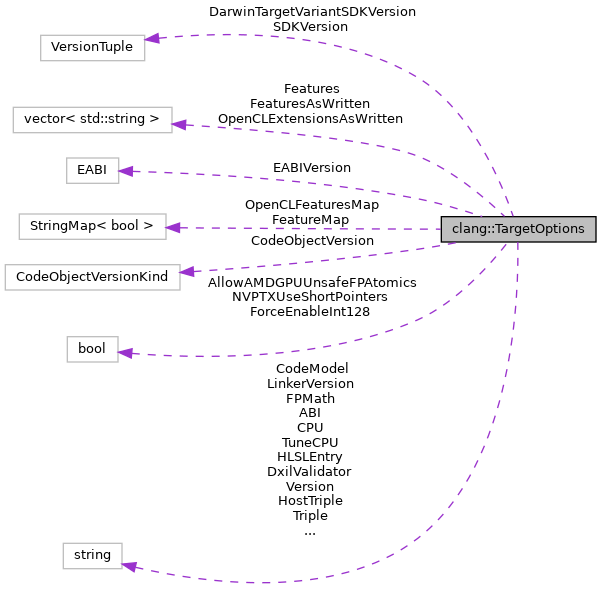 Referenced by clang::ASTReader::isAcceptableASTFile(), and ParseTargetArgs(). Definition at line 75 of file TargetOptions.h. Referenced by ParseCodeGenArgs(), and ParseTargetArgs(). If given, the name of the target CPU to generate code for. Definition at line 36 of file TargetOptions.h. Referenced by getCudaArch(), clang::ASTReader::isAcceptableASTFile(), isGCCAsmStatement(), ParseTargetArgs(), runThinLTOBackend(), and clang::CodeGen::CodeGenModule::SetCommonAttributes(). The EABI version to use. Definition at line 45 of file TargetOptions.h. Referenced by clang::targets::AArch64TargetInfo::AArch64TargetInfo(), clang::targets::ARMTargetInfo::ARMTargetInfo(), and ParseTargetArgs(). The list of target specific features to enable or disable – this should be a list of strings starting with by '+' or '-'. Definition at line 55 of file TargetOptions.h. Referenced by clang::targets::AMDGPUTargetInfo::adjustTargetOptions(), getCudaArch(), clang::ASTReader::isAcceptableASTFile(), isGCCAsmStatement(), runThinLTOBackend(), setCommandLineOpts(), and clang::CodeGen::CodeGenModule::SetCommonAttributes(). The list of target specific features to enable or disable, as written on the command line. Definition at line 51 of file TargetOptions.h. Referenced by clang::targets::AMDGPUTargetInfo::adjustTargetOptions(), checkTargetOptions(), clang::ASTReader::isAcceptableASTFile(), clang::targets::NVPTXTargetInfo::NVPTXTargetInfo(), and ParseTargetArgs(). If given, enables support for __int128_t and __uint128_t types. Definition at line 65 of file TargetOptions.h. If given, the unit to use for floating point math. Definition at line 39 of file TargetOptions.h. When compiling for the device side, contains the triple used to compile for the host. Definition at line 33 of file TargetOptions.h. Referenced by clang::CompilerInvocation::CreateFromArgs(), and clang::targets::NVPTXTargetInfo::NVPTXTargetInfo(). If given, the version string of the linker in use. Definition at line 48 of file TargetOptions.h. If enabled, use 32-bit pointers for accessing const/local/shared address space. Definition at line 69 of file TargetOptions.h. Referenced by clang::targets::NVPTXTargetInfo::NVPTXTargetInfo(), and ParseTargetArgs(). The list of OpenCL extensions to enable or disable, as written on the command line. Definition at line 62 of file TargetOptions.h. The version of the SDK which was used during the compilation. on darwin the version is propagated to LLVM where it's used to support SDK Version metadata (See D55673). CUDA compilation uses it to control parts of CUDA compilation in clang that depend on specific version of the CUDA SDK. Definition at line 83 of file TargetOptions.h. Supported OpenCL extensions and optional core features. Definition at line 58 of file TargetOptions.h. Definition at line 29 of file TargetOptions.h. Referenced by clang::CompilerInvocation::CreateFromArgs(), clang::CodeGenAction::ExecuteAction(), HasARCRuntime(), clang::ASTReader::isAcceptableASTFile(), ParseCodeGenArgs(), ParseLangArgs(), and ParseTargetArgs().